It’s cucumber season and our garden is OVERFLOWING! 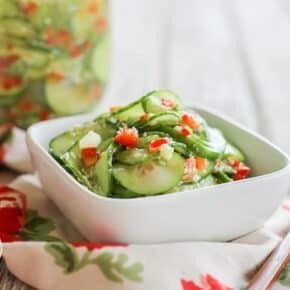 Needless to say it’s time to get creative with the cucumber recipes while they are in abundance and this Marinated Asian Sesame Cucumber Salad is a delicious way to enjoy not only the summer harvest but anytime throughout the year. 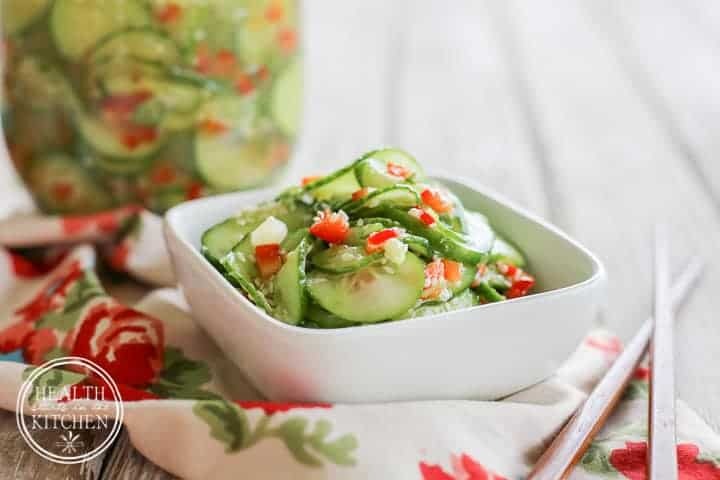 This Marinated Asian Sesame Cucumber Salad is perfect for picnics and potluck dinners, since it’s best when made ahead, allowing ample time for the flavors to combine. 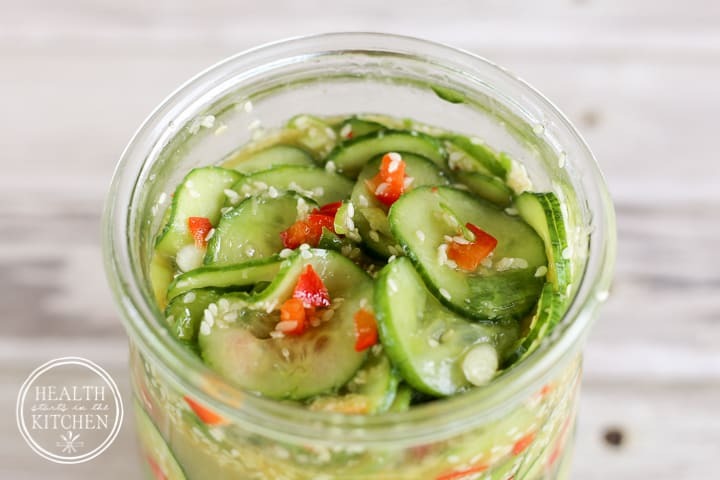 Thinly sliced cucumbers (I use THIS inexpensive MANDOLINE with THIS CUT-RESISTANT GLOVE to make quick work of slicing and to get a uniform thickness), finely chopped sweet red peppers and sliced fresh scallions, all tossed with a delicious Asian inspired sesame dressing. I like to add a little pinch of crushed red pepper to give it just the slightest bit of heat but feel free to omit it if you prefer no-heat at all. 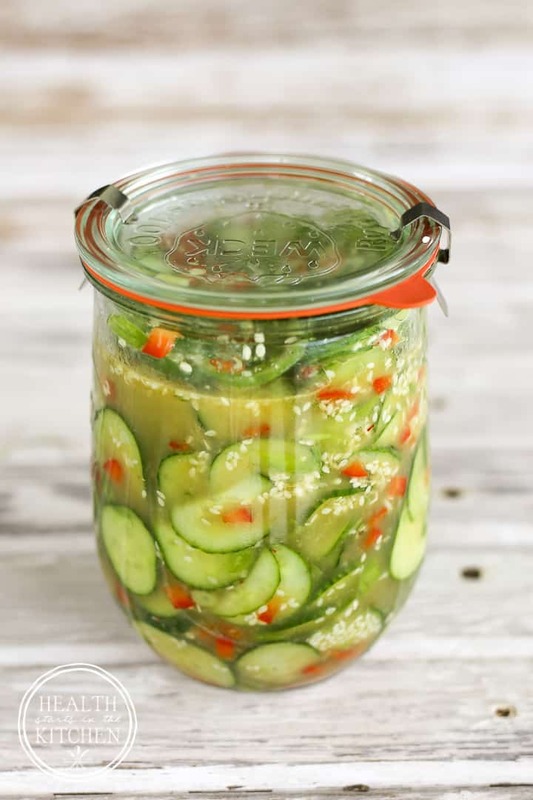 Pack your Marinated Asian Sesame Cucumber Salad in to a jar, cover with a lid and allow it to chill in the refrigerator for at least 1 hour, but for the best full-flavor let it marinate overnight. I like to use these beautiful Weck Jars, THIS #745 Tulip Jar holds a double batch perfectly. 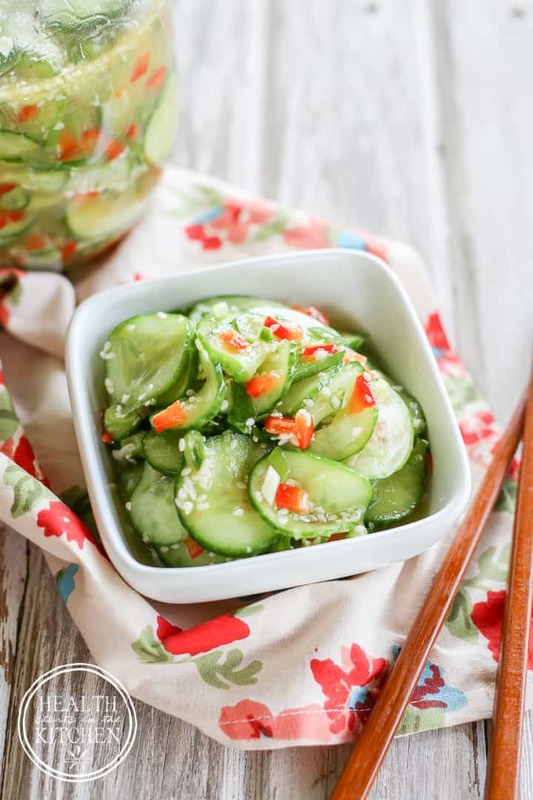 Serve this Marinated Asian Sesame Cucumber Salad as a crisp, refreshing appetizer salad before your meal or a prefect in between meal snack on a hot summer afternoon. 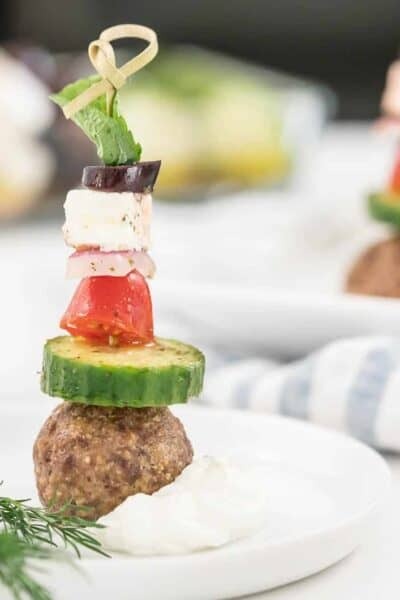 It’s also delicious as a side dish for my Napa Cabbage Wrapped Pork Shiitake Rolls to make it a complete meal. 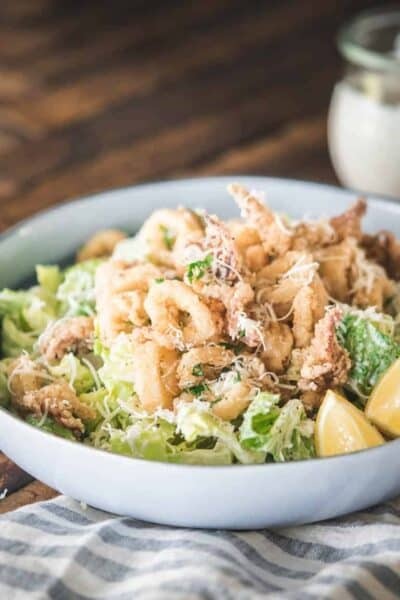 Oh and one last thing, if you’re looking for the best prices on the Asian Ingredients for this salad dressing, I recommend shopping at Thrive Market – You’ll save 30-50% off the regular prices. 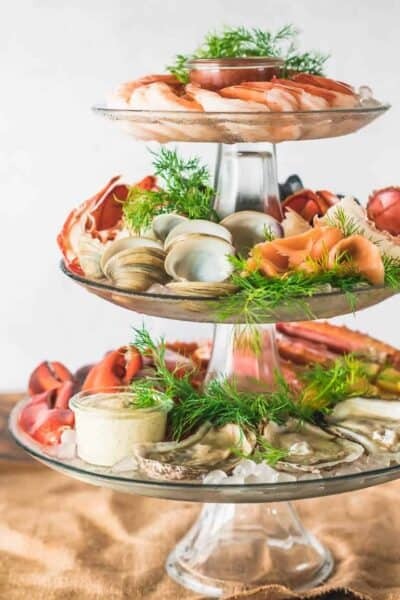 Combine all ingredients and mix well, season to taste with sea salt and crushed red pepper, if desired. Thinly slice cucumbers, preferably using a mandoline. Combine with chopped peppers and sliced scallions. 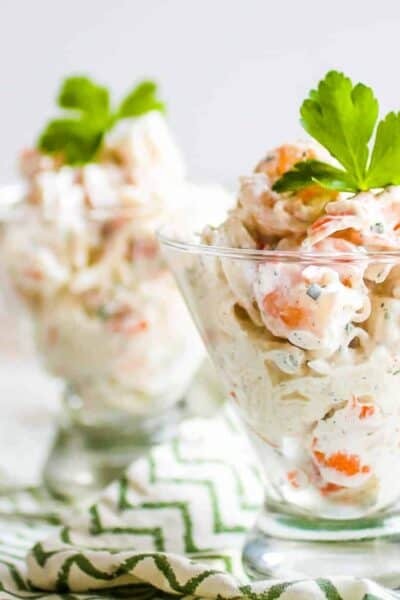 Toss salad with dressing. 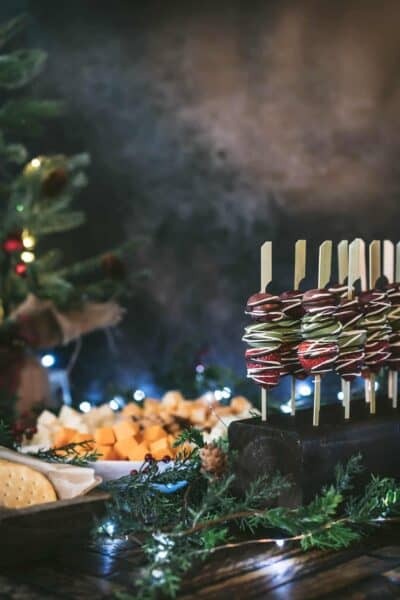 Can be served immediately but best if allowed to marinate for at least 1 hour in the refrigerator - can be made the night before and allowed to marinate for best favoring.